Happy first day of spring! Our family had a blast in the snowy mountains last week for spring break, but I’m welcoming this change of pace with open arms now that we’re back home in Houston. 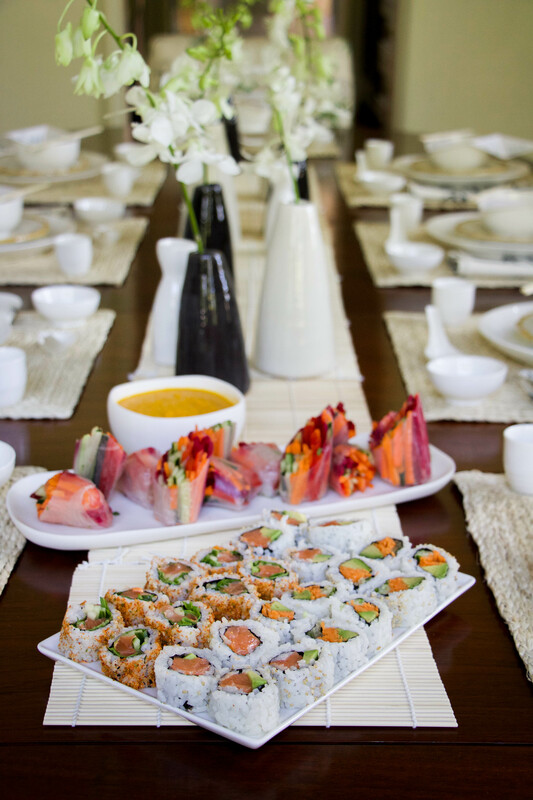 Spring is the perfect time of year to invite friends and neighbors over before crazed summer schedules get in the way, so it seemed like the perfect time to debut this Oriental inspired sushi dinner party from my dining room. 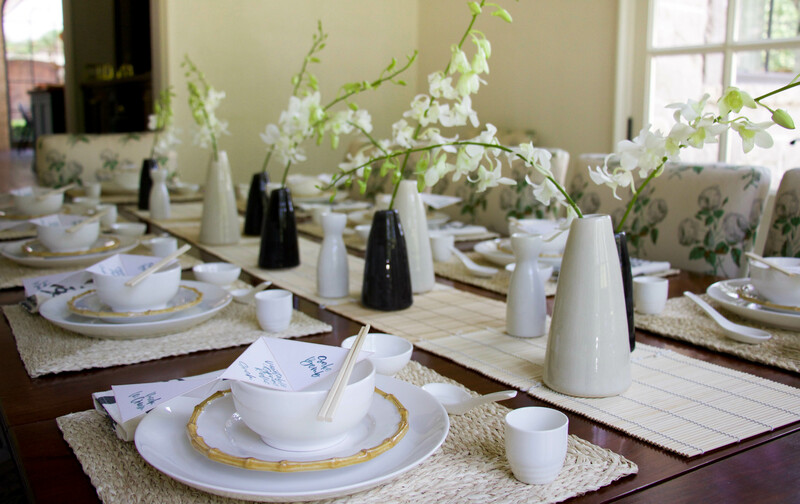 The white and black bud vases of varying shapes and sizes filled with drooping orchid branches of were super simple to scatter across the table atop the bamboo runner. 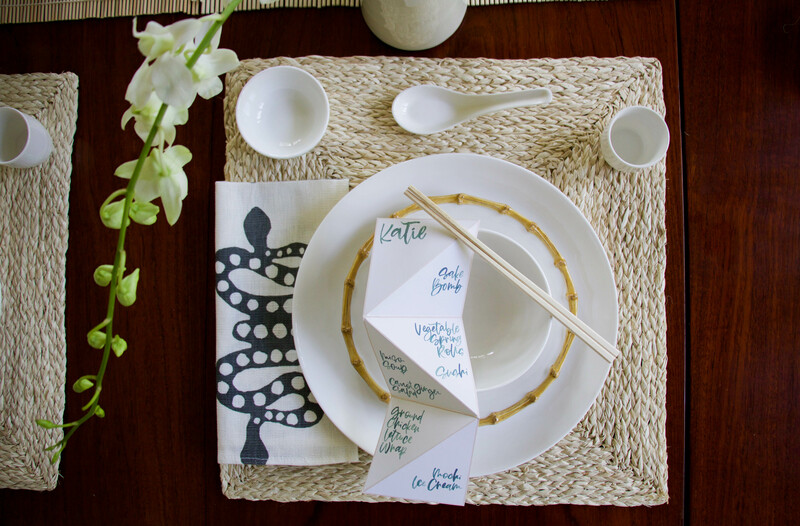 The napkins are some of my favorites — I love the unique print (of Block & Brayer – check out all their fun designs) and find more use for them than you’d think. 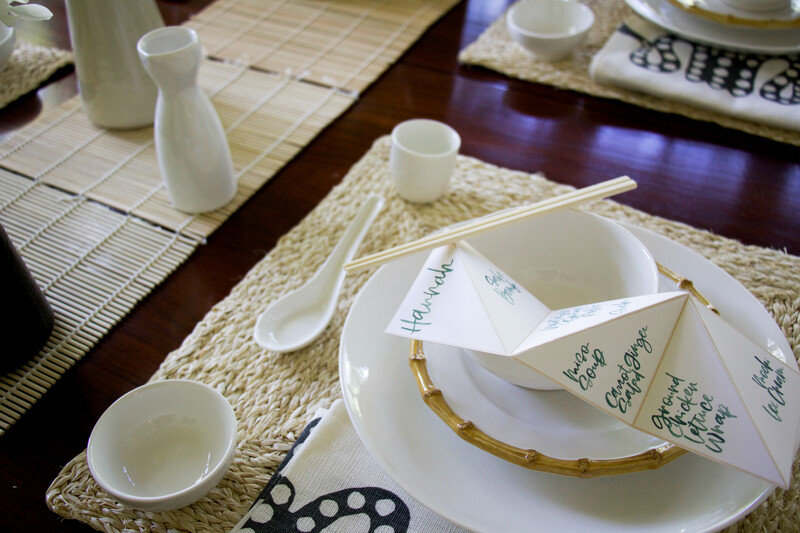 Of course, the origami menu (a la Meg Grant!) 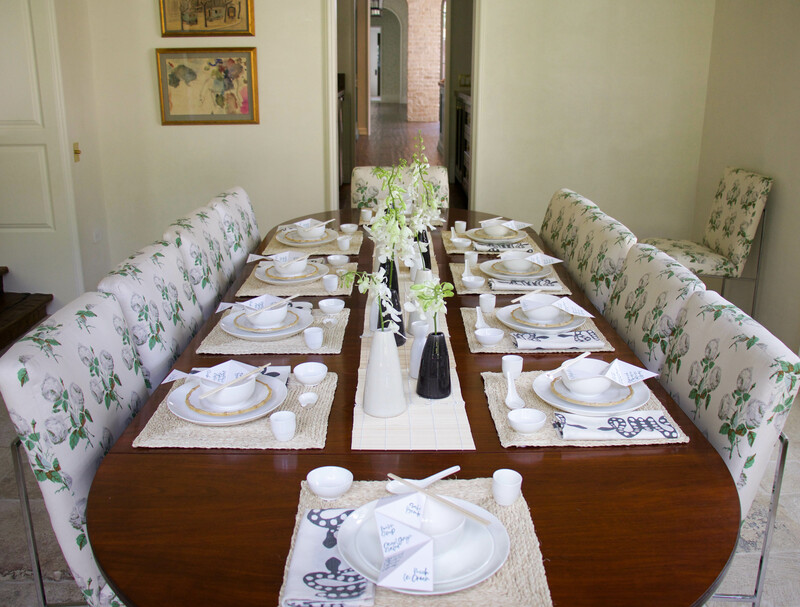 really helps the whole look lean into the supper’s Asian theme. 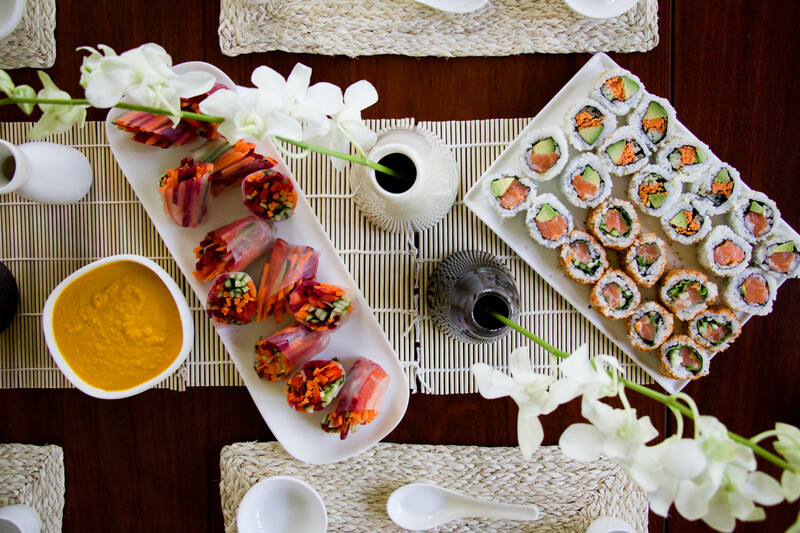 We served colorful spring rolls as appetizers, which are especially nice because you can prepare them the day before and have one less thing to worry about the day you’re playing host. I can’t not dress for a theme, so I was excited to find this silk cape top by Caroline Constas that felt more than appropriate. That style sold out, but here’s that same silhouette by her in such a fun, retro floral for spring and summer. We snagged the sushi from our favorite local spot, so that was even easier, but I’d give you bonus points if you prepared your own or even did a DYI bar situation where everyone could choose their sushi adventure. When was the last time you had people sake bombing at your house? Or sake bombing in general?! It was fun to depart from the typical Italian spread or steak grill-out, and I honestly can’t think of a friend who doesn’t love Asian fare. 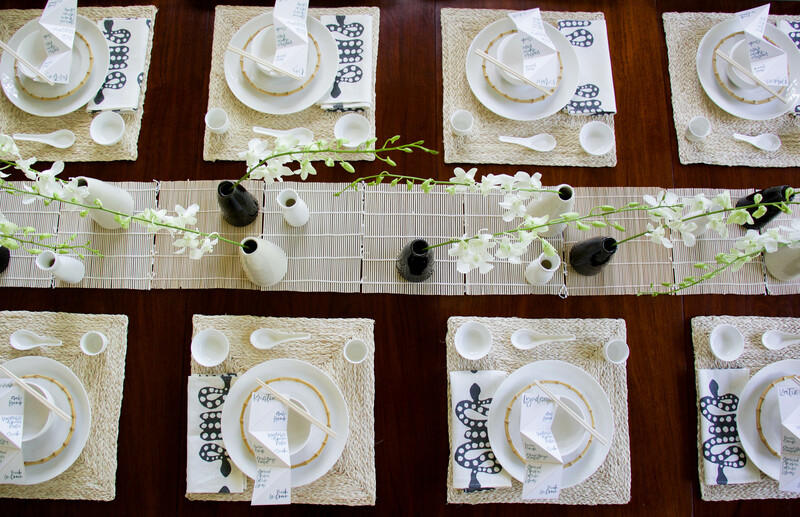 The bamboo plates obviously do this theme a great service. 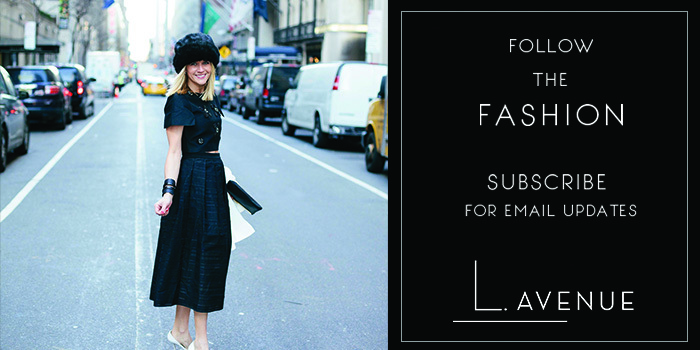 Keep scrolling for purchase details on all the other pieces.